One of my particular interests in recent books, oft explored in this blog, is fiction by women about the wars in Iraq and Afghanistan, especially the nature of PTSD and soldiers’ attempts to reenter civilian society. While this subject has been revived by the latest war(s), it is as old as war itself. One can find classic novels about the post-war experience following the Civil War, World War I, World War II, Korea, and, of course, Vietnam. Perhaps the best writing about soldiers’ post-war lives are the novels set during and just after WWI by British writers Pat Barker (the Regeneration trilogy), Sebastian Faulks (Birdsong), and Elizabeth Jane Howard (The Cazalet Chronicles). The Great War, with its trench warfare and first use of poison gas and aeroplanes, produced a level of carnage not seen before. Many of those who survived returned home with head injuries, missing limbs, lung damage, and/or shell shock, only to find that they were faced with fighting another war on the home front, one for acceptance and normality. 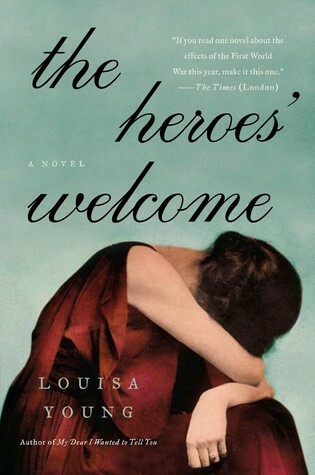 Louisa Young’s The Heroes’ Welcome is the second book in a planned trilogy that began during the war with My Dear I Wanted to Tell You. And while it is probably best to have read the first book, one can still read the second book without feeling she is missing too much. On the other hand, the consensus among those who have read both novels is that My Dear is the better of the two books; so if the subject and premise interest you, it is probably worth starting at the beginning. Heroes picks up in 1919, six months after Armistice Day, as 23-year-old Captain Riley Purefoy returns to London with a mouth and jaw that have been reconstructed through surgeries that were groundbreaking at the time. His appearance is unsettling to others, he has immense difficulty eating, and he cannot speak clearly. He would appear to be on the path to a life of isolation. But his fiancee, Nadine Waveney, awaits him, and they quickly marry and attempt to build what they know is a life that bears little resemblance to the one they’d planned. The stereotypical British reticence to talk things out only complicates the fraught circumstances, as does the disapproval of Nadine’s parents. The other central characters are Riley’s commanding office, Peter Locke, and his wife, Julia. While Peter is physically whole, he is emotionally shattered by certain events in the war, and takes solace in alcohol, with predictable results on the condition of his mind and his marriage. Young’s book explores the heroism displayed at home by returning soldiers like Purefoy and Locke. For despite their very human flaws and failings, they want desperately to regain their footing and make their way with their wives, work, and the world. The narrative involving Riley and Nadine is more involving and satisfying, as they are more sympathetic characters and they behave as rationally as one could expect. The story of Peter and Julia (and their young son, Tom) is more melodramatic, even Gothic at times (Julia’s affair). This strand is just not executed as well, or perhaps it is just not as plausible, which seems crucial in a setting that demands realism. The two aspects of The Heroes’ Welcome that stand out are Young’s handling of inner monologues and her fluid prose, which provides an elegance that suits the Downtown Abbey-like setting. Occasional overwriting doesn’t get in the way of these characters and their heartbreaking conflicts. While The Heroes’ Welcome is not quite in the same class with the work of Barker, Faulks, or Howard, this is a respectable addition to the literature of WWI, a historical drama that combines literary fiction and elements of melodrama to create an involving and at times powerful novel. An advance copy of The Heroes’ Welcome was provided to me by TLC Book Tours in exchange for my honest opinion. You can read reviews by other participating bloggers from March 10-March 30 here. Thanks for sharing your thoughts on this powerful read for the tour.